Originally built as the village school. The Community Centre is owned by Aberdeenshire Council but managed by the Community Council. Everything in the building has been financed or bought with community funds. A huge amount of work has been undertaken by members of the Slains and Collieston Community in recent years to improve our community buildings. Going back as far as 1996, when there was mention of the local authority considering the closure of small rural centres, work began to secure our hall for future generations. Early plans were to submit an application to the National Lottery’s 21st Century Halls programme. 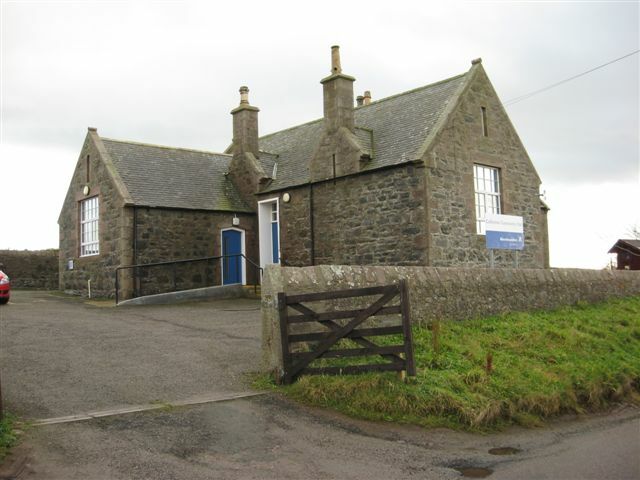 Plans were drawn up by Aberdeenshire Council which were to incorporate the schoolhouse into the overall Community Centre to give more space for multi purpose use. However this was not achievable in the timescale due to a variety of issues. After that a new group was established – Collieston and Slains Community Trust who put in an immense amount of work with innovative plans for a new hall and respite centre. The bid to the Big Lottery was unsuccessful, and it was back to the drawing board again. The Community Council went back to the original idea of breaking through to the schoolhouse to open up the building and create more communal space and vital storage. Working in partnership with the local authority, successful applications were made to the Council’s “100 day pledge” fund, intended to encourage investment in local towns and villages, and also to the SITA Trust. The local community contributed £10,000 towards the upgrade – the total works being in the region of £120,000. When work on the building was completed, the next task was to tackle the old schoolhouse garden. The rear wall was in a dangerous condition and which the Council did not have funding to repair. The Community Council got permission to demolish the rear wall while at the same time creating a new outdoor garden area.